At mustard.co.uk, we understand just how important it is to find car cover that you can trust, at a price that fits your budget. As a comparison site that’s 100% independent, we wanted to find out what you thought of your insurer and asked you to rate them in a number of areas including ease of purchase and whether or not you’d recommend them. Nearly 10,000 of you completed our survey and as well as giving us an overall winner in terms of customer satisfaction, your responses also revealed some interesting facts while reinforcing other well-known truths. It’s common knowledge that young drivers pay more for their car insurance than any other age group. It’s a fact highlighted in our survey as respondents aged between 17-24 paid an average annual premium of more than £900 compared to just £467 for 40-49 year olds and £390 for 50-59 year olds. Our research also shows some startling regional price differences. Drivers in the South-West of England enjoyed the lowest average premium (£399) followed closely by respondents in Scotland who paid £401. 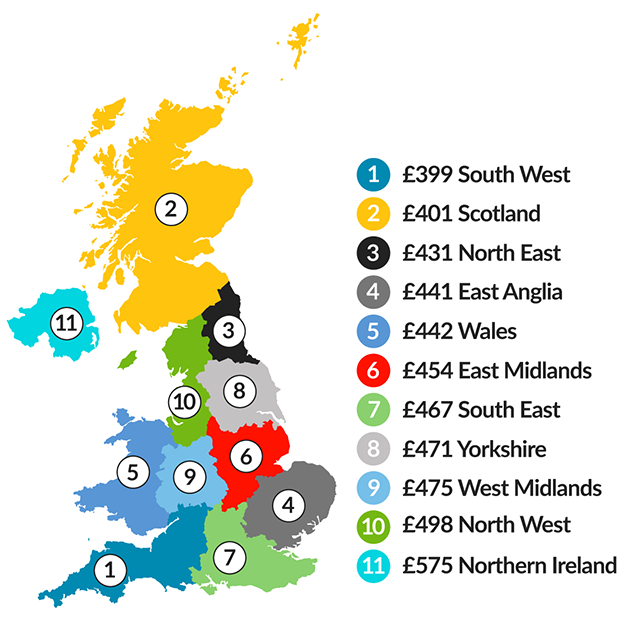 The North-West proved the most expensive English region with cover topping £498 while those of you in Northern Ireland paid the highest premium of all at £575. 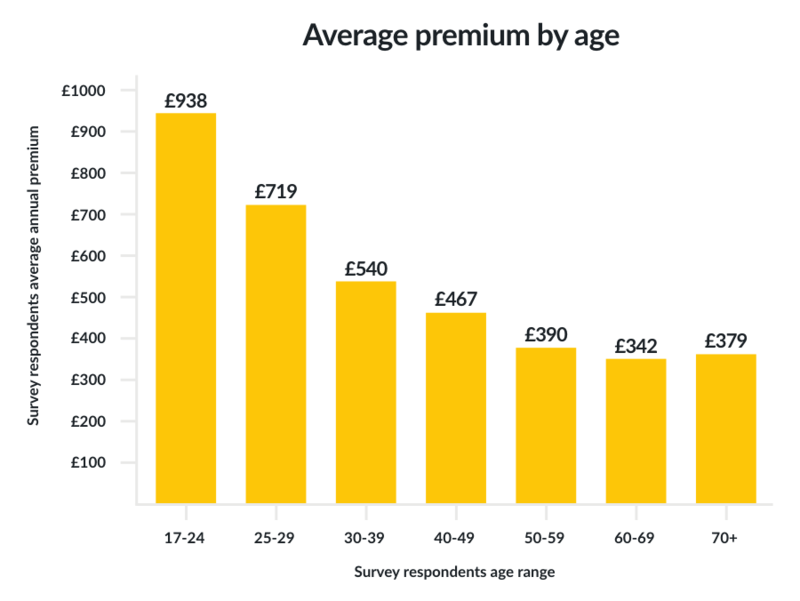 Unsurprisingly, price remains a key driving factor for all age groups, however we did find that young drivers were more heavily influenced by price than any other age group, with 84% of 17-24s saying cost was the reason for being with their current provider. That figure fell steadily for each subsequent age bracket with those aged 60 and over being the least influenced by price. Young drivers aged between 17-24 were also twice as likely to value recommendations about insurance providers compared to those over 40 (17% vs. 7% respectively). On the other hand, drivers over 50 were more heavily influenced by a company’s reputation. The importance of features offered as standard was fairly consistent across the board but particularly appealed to those aged 17-24 and the over 50s, with 1 in 5 agreeing it was something they valued and would influence their choice in policy. All the insurers in our list scored well for ease of purchase with LV topping the list for online simplicity and NFU Mutual for their speed and simplicity over the phone service. Again all providers in our best insurer list rated highly for their product knowledge while Tesco, Saga, LV and NFU Mutual (again) particularly stood out for their polite telephone service. Based on your responses this is how you rated the best insurance providers, so let’s take a look and see how they fared. Over 100 years old, NFU Mutual started selling insurance in a bid to encourage Warwickshire’s locals to join the Farming Union. Thanks to their consistently high scores across the board, NFU Mutual came top for overall customer satisfaction. An overwhelming 96% of you said you’d renew your policy with them and 97% would recommend NFU Mutual to friends and family. The insurer also came top for simplest and fastest purchase process and were rated number one for claims and knowledge. LV started life as a mutual society with agents originally selling life insurance ‘penny policies’ door to door in Liverpool. LV came top for overall experience of buying car insurance online and achieved a solid 9.1 out of ten for purchasing over the phone. Tesco began life as a joint venture between RBS and Tesco, they became solely Tesco owned in 2008. They scored well for their product knowledge with an impressive 9.2 out of ten and came second for their over the phone purchasing process. Churchill launched in 1989 and were one of the very first companies to offer car insurance direct to motorists. They were rated in the top three insurers for ease of contact and politeness during the claims process. Respondents rated Aviva as the best insurer for settling a claim within an acceptable amount of time. Although Aviva is not available to buy on comparison sites, Aviva’s Quote Me Happy and General Accident brands are. Established in 1985 Direct Line is another direct to customer provider. You rated them in the top five insurers for ease of purchasing over the phone and making a claim. Saga is one of the most recognisable over 50s specialists. They ranked in the top three for keeping customers updated with their claim and an impressive 80% of respondents would recommend them. Headquartered in France and with millions of customers across the globe, AXA is the world’s largest insurance provider. Survey respondents rated them in the top five insurers for having a simple, online purchase process. Launched in 2000, esure became one of the fastest growing insurance companies in its first five years. Customers scored them highly for speed and simplicity in their online purchase process. The UK’s first multi-car insurance provider scored a solid 9.2 out of ten for their politeness when customers bought policies over the phone. Hastings Direct launched in 1997 and are one of the fastest growing insurance providers in the UK. Customers ranked them particularly highly for their product knowledge and politeness over the phone. Figures are based on responses from 9,761 participants of which 8,196 are UK car insurance policy holders. The customer satisfactions score is calculated using an average of the overall satisfaction levels for online purchasing, over-the-phone purchasing and overall claims experience. The 11 insurers rated each have a sample of over 150 purchasers. Not all purchasers have made a claim.